SEPP Blatter has received a boost in his bid to retain the FIFA presidency as Jordan's Prince Ali Bin Al Hussein has been elected a FIFA vice president. Seen as being close to Blatter, Prince Ali beat South Korean incumbent, Chung Mong-joon, in the Asian Football Confederation congress vote in Doha. His election seems to end the possibility of Chung challenging Blatter in June's FIFA presidential election. Chung has been highly critical of Blatter's term in office. Blatter said before the vote: “All these successes have created a lot of envy and jealousy in our world because you cannot satisfy everybody. At 35, Ali, the son of Jordan's late King Hussein and Queen Alia, will become the youngest member of FIFA's executive committee after beating South Korean Chung, who has sat on the board since 1994, by 25 votes to 20. Ali's supporters had hoped that grateful Middle Eastern delegates would back their candidate after FIFA's decision to award the 2022 World Cup to Qatar, and he was keen to reinforce his links with the current FIFA president in his YouTube promotional video. Chung, in contrast, has been - in the context of senior FIFA members' usual restraint - an outspoken critic of Blatter. Ten years ago, the 59-year old was critical after evidence of financial impropriety from the collapse of a marketing company that worked for FIFA emerged. 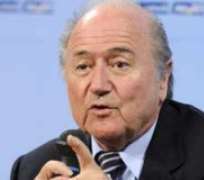 Blatter has held the post since 1998, winning a re-election fight in 2002 before clinching a third term unopposed in 2007. FIFA executive committee member, Mohamed Bin Hammam, had previously suggested that he would not stand against Blatter, but on Wednesday he refused to rule out running. “Some of FIFA's acts I do not approve of or agree. I think FIFA needs a lot of improvement,” Qatari Bin Hammam, who led his nation's successful bid to host the 2022 World Cup finals, said. Bin Hammam was angered by Blatter's decision to launch an anti-corruption committee without consulting the executive committee. Bayern Munich President, Uli Hoeness, has called more forcefully for fresh leadership at the top of FIFA. A World Cup winner with West Germany in 1974, Hoeness believes the game's traditional European powers must lead a challenge to Blatter.